The growing automotive market every year brings Gran Turismo concepts, here our today’s model is yet another in the list of stunning exterior and power-packed engine from the house of Aston Martin and unveiled at Goodwood Festival of Speed. The virtual supercar portrays company’s approach in designing and view towards the future of supercars. 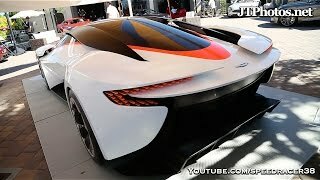 Let is have a look at the Aston Martin DP-100 Vision Gran Turismo Concept 2014 and get to know more about the concept. 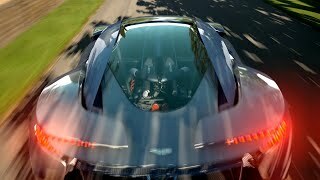 Being a virtual model Aston Martin DP-100 Vision Gran Turismo Concept 2014 has no interior details but it can’t exist without a body, the outer shell which undoubtedly is gorgeous. 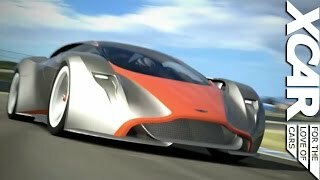 Looking at this Aston Martin Vision Gran Turismo Concept 2014 you’ll have your expectations with Aston Martin’s future supercars flying high in sky. The traditional grille adds to intense looks of concept, making its house close to ground the grille will bring portray of future in front of your eyes. Moving ahead in front fascia of Aston Martin DP-100 Vision Gran Turismo Concept 2014 you’ll find the standard bumper getting replaced with all new three-piece lip spoiler. Wheels get covered by the muscular wheel arches rising a bit above the beltline and giving home to rectangular LED headlights. 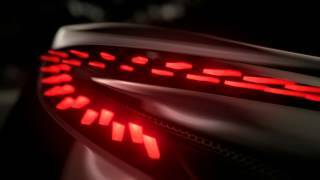 Moving towards the rear fascia of Aston Martin DP-100 Vision Gran Turismo Concept 2014 you have a massive carbon-fiber diffuser while the exhaust system finds its place between the spoiler and aerodynamic element. LED tail lights are mounted over the unique spoiler; precisely on both its ends (we know its logic). Adding to menacing looks is the see-through housed engine in the center. One thing's for sure that being a Gran Turismo Concept the Aston Martin DP-100 team would have housed unmatched power beneath its hood. Now here is a surprise, for the first time Aston Martin in bringing the AMG power in its line-up. Delivering 800 hp of total output you’ll find a V12 engine sitting behind that transparent engine roof. Though nothing has been shared about the displacement figures and performance statistics but expecting a 6.0 Liter bi-turbo sounds safe. 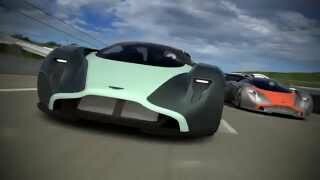 Rest we’ll have to wait till company reveal complete specifications of Aston Martin DP-100 Vision Gran Turismo Concept 2014.